Please refer to our stock # T 1733 when inquiring. Signed amethyst Peruzzi SB earrings with the earlier desirable Florence 800 Silver Mark and the added unusual FAP Italy mark. Signed: PERUZZI FLORENCE 800 SILVER and FAP ITALY. 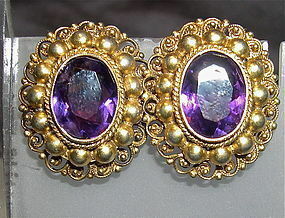 These 80% silver SBs are covered with a warm gold finish and hold 10mm faceted yummy amethyst bezel set stones. 7/8" and very little gold wear where expected for age and use: turn wheels and at the loop that hugs the lobe. $11 USPS Priority/Ins/Track or Free with your USA check or USPS MO. Please collect with confidence after reviewing the dozens of Trocadero verified testimonials then view All images for more info as all Qs will be answered here in lieu of email reply. Don't miss this!